Inside the rough, red wooden doors awaits an antique shop. As you walk the century-old tan and orange brick floors, you’ll pass through rooms filled with repurposed farm tools, earth-toned ceramic bowls, green glass wine jugs, wooden wagon wheels, and vintage toys. The walls are covered with authentic signs, paintings, and advertisements from days gone by. To the right is the front desk, where you will check in for a truly unique and peaceful experience. 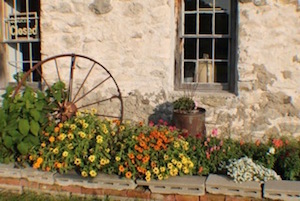 Cornerstone Suites, located in Door County, WI, a peninsula bordered by Green Bay and Lake Michigan, is set in the heart of small-town Wisconsin. 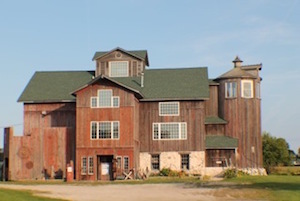 The 100-year-old barn has been lovingly restored by husband and wife team Mettie and Daryl Lautenbach, along with their sons Linc, Luke, and Lief, after being destroyed by a tornado in July of 1998. 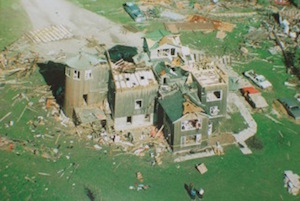 On that terrifying day the Lautenbachs, along with their daughter-in-law, their 8-month-old grandchild, and the family dog, took cover in the cement silo as the tornado ripped apart nearly 95% of the structure. “The silo’s walls lifted up, and set back down again,” recalls Mettie. “That’s when things got scary.” Thankfully, no harm came to the family that frightening day, but the devastation was catastrophic. What wasn’t completely decimated needed to be repaired in some way. The Lautenbachs took the next year to lovingly design and rebuild the barn to all its former glory. Originally, the Cornerstone had living quarters for one family. Now housing four unique 1,000-square-foot suites, there is plenty of room to spread out and relax. Each of the unit’s well-designed interiors — with all the creature comforts — gives you a sense of home. An open floor plan with warm hardwood floors, light and airy painted walls, and vaulted ceilings with skylights and original barn beams provides the perfect backdrop for the shabby-chic décor. Rustic, hand-painted, distressed kitchen cabinets, farmhouse tables, one-of-a-kind accent pieces, comfortable upholstered furniture, and vintage art make the cozy spaces feel warm and inviting. Each unit has a gas log fireplace to set the stage for curling up with a good book and a glass of wine by the fire. Fully equipped kitchens, personal decks overlooking the countryside, whirlpool tubs, flat screen TVs, and Wi-Fi will leave you wanting for nothing. Personal touches are found throughout the suites. A wide selection of movies appealing to all ages, rooms stocked with books, magazines, and brochures on area attractions, plenty of fresh sheets, towels, pillows, and soaps, and a gift basket filled with coffee and homemade salsa from the farmers’ market show the care the family has taken to ensure their guests feel right at home. Located minutes from the tourist towns of Egg Harbor, Fish Creek, Baileys Harbor, and Sister Bay, you will never be without something to do. Just far enough outside of town to provide respite to a weary soul, a few days of peace, quiet, and relaxation at Cornerstone Suites will leave you feeling refreshed and renewed. 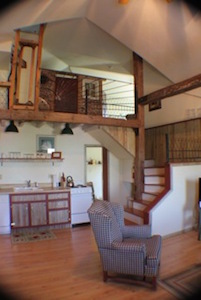 With only four vacation rentals available, a place this special helps you understand just why the Lautenbacks always remind their guests to “Only tell your best friends about us.” Visit www.cornerstonesuites.com for more information.